I’ve been getting ready for a Macmillan coffee morning this week, fitting in a bit of baking since it’s been a bit too wet and wild to merit spending time in the veg patch (I’m definitely a fair-weather gardener!) 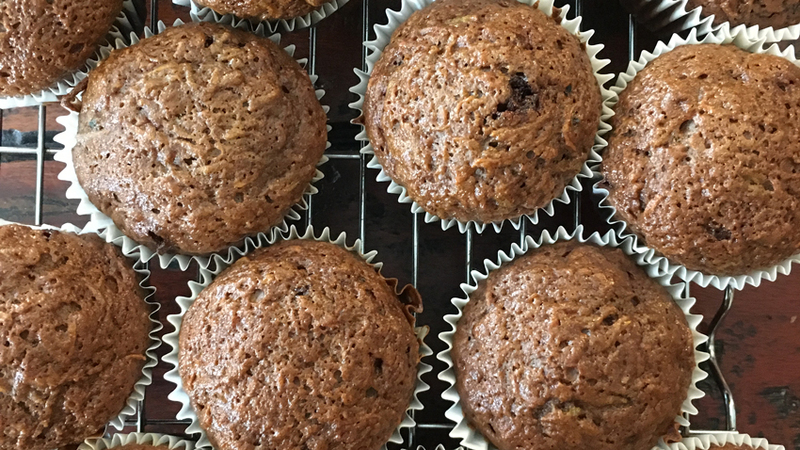 In a bid to use up as many courgettes as I can, I decided to bake all my cakes using veg (and fruit) from the garden, and it’s been quite fun finding and trying the different recipes. Lemon Courgette Drizzle Cake – I used Mary Berry’s recipe for lemon drizzle cake and added a large grated courgette to the mixture. I have to say, it tastes pretty good and is nice and moist. Please don’t tell Mary Berry that I deviated from her original recipe! Rainbow Carrot Cupcakes – My carrots weren’t much to look at when I harvested them, very knobbly and gnarly! But they were great for grating and I made three different carrot cupcake mixtures, one with purple carrots, one with white/yellow carrots and one with orange carrots. You can’t really tell the difference between the white and orange, but the purple ones are a lot darker so the contrast is nice. Jerusalem Artichoke Cake – I haven’t made this yet, but it’s on the agenda for the weekend. It’s one of the cinnamon/nutmeg typed cakes, but I couldn’t find many other options and Mark Diacono seems like a reliable recipe source. Hopefully this might be food for thought for any other Rocket Gardeners out there who are getting involved with Macmillan’s coffee morning this week….good luck and well done to you all! ← How much planting time is left for autumn?